Rimzim Dadu is known for unique interpretation of textiles and her expertise in changing the very nature of materials she uses to create new texture surfaces. 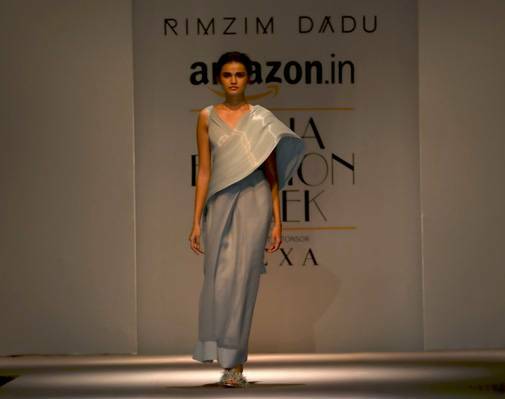 Her skills were on full display on Wednesday when she opened the prestigious Amazon India Fashion Week in Delhi. The designer, who is known for using art installations, technology and craftsmanship to design her shows, impressed audiences with yet another dazzling display of a designing master-class this season. She had transported her entire studio on the ramp last year to showcase her intricate techniques. Following the success of the "Artisans on the Ramp", she created "The Maze" in Mumbai for another show that explored the artist's understanding of modern times that we live in. So the weight of expectations was high this season. The show started with a dazzling display of 3D projections on two huge panels made out of her signature cords. As the show progressed, the panels showed the intricate patterns and techniques she had used this season. The smart use of 3D projections created an immersive experience. She explained that it took more than two months to put the show together. "The projections had to match the collection, and we had to get several technical details right. But I had great support from experts at the Fashion Design Council of India to put the show together," she said. Dadu explained that her work involves "a lot of craftsmanship and fine techniques". "That is why I always try to involve the audiences in understanding what goes behind in creating our unique textures. People always appreciate art more when they know the hard work and techniques that go into the process of creation," she added. Dadu's signature molten steel-wire technique received a new treatment in this collection. The sky blue dress and the sari were so fluid, but still gave a sculpted look. The models looked like literally wearing waves! She also reinterpreted the zari and resham threads to create some of her pieces in the collection. "People usually associate zari and resham with embroidery. But I changed the nature of these cords to make them grunge - a little stiff but without making them lose their fluidity," she said. Dadu's collections look very simple, but once you look closer, you realise how complex her techniques are. It's no surprise why she calls her studio "a lab for experiments". And that is where her strength lies - she makes most complex techniques look simple on the ramp. She gave a miss to her signature 3D floral technique this year, but flowers were not missing from the collection. Some of her "net dresses" had intricately woven flowers. In a first, she also presented a bikini that had cord work on it. Was that a sign for the future? Dadu doesn't reveal much but adds that her swimwear collection may be in the offing. The collection only had 24 pieces but each stood out because the way the collection was edited. She started with sombre black pieces and then progressed to bright golden and silver zari cord-based pieces. 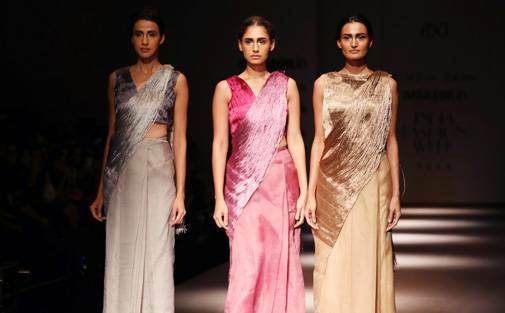 She closed the line-up with saris, something the designer has become known for. "After my blue steel-wire sari received great reviews last year, I decided to continue working on it. The sari is such a beautiful and essential clothing piece for Indians, but the garment has stayed the same for decades. I feel people want a fresh take on the sari and I am doing my bit in filling the demand," she said. The saris with zari cords were beautiful. It's safe to say that very few designers reinterpret the sari the way Dadu does. "For now I am looking forward to a lot of sleep, and then the next collection and the show," she explained. Will the next show again be experimental? She just smiles. But we know the answer - her shows have become a spectacle worth waiting for.